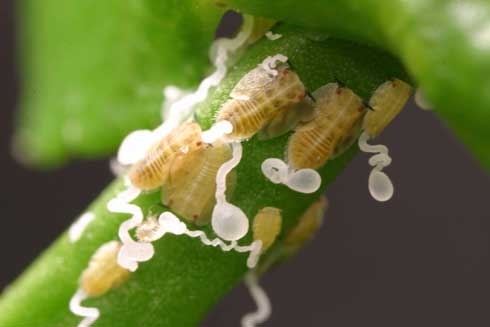 In light of spotting a couple of Asian citrus psyllids (ACP) in Ventura County about a month ago, it is important to be aware of this exotic and invasive pest and its damage potential. ACP, Diaphorina citri Kuwayama (Homoptera: Psyllidae) looks like a miniature cicada. Psyllids are similar to aphids except that they have longer antennae and strong jumping legs hence the name jumping plantlice. Origin and distribution: Although native to Asia, ACP has worldwide distribution in tropical and subtropical regions. After its first discovery in Florida in 1998, it has now spread to Texas and California as well as neighboring Bahamas, Cuba, Jamaica, Mexico, Puerto Rico and other areas. With its recent detection in La Conchita and Santa Paula areas, the entire Ventura County along with southern Santa Barbara and western Riverside Counties are now considered as quarantined areas. Damage: ACP is a phloem feeding insect that consumes copious amounts of phloem sap and secrets large quantities of honey dew resulting in sooty mold growth. Nymphs feed exclusively on young leaves and shoots. Feeding damage includes cessation of terminal growth and malformation of developing parts. Mature plants can withstand feeding damage to some extent, but it is severe in nursery stock and developing young trees. Additionally, ACP transmits an endocellular, phloem-limited bacterium, Liberobacter asiaticum that causes citrus greening or huanglongbing (HLB) or yellow dragon disease. It is also called citrus Likubin or dieback or leaf mottle in different Asian countries. Native to China, citrus greening was first detected in Florida in 2005 and is a more serious threat than the feeding damage. This disease is transmitted when ACP feeds on a healthy plant after feeding on a diseased plant. Disease stays latent for sometime before symptoms appear in an infected plant. Typical symptoms include mottling and yellowing of leaves. As the disease progresses, small and narrow leaves, short stems, stunted growth, poor flowering and dieback can also be seen. Infected fruit is small, hard, lopsided with dark seeds and bitter juice. 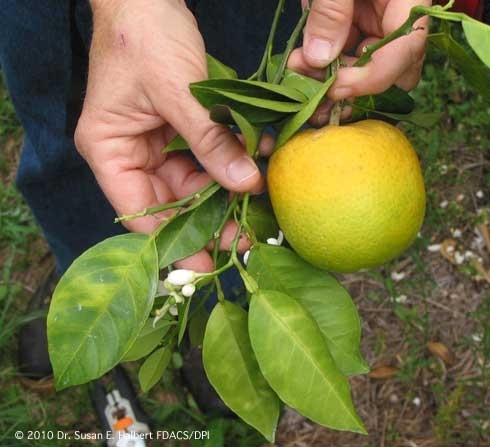 Host range:Citrus and closely related species like orange jasmine are susceptible both to ACP and citrus greening. Citropsis, Citrus and Murraya are preferred genera in the Rutaceae family. 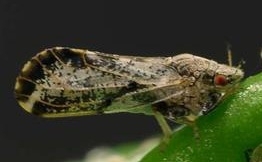 Biology:Adults are 3-4 mm long insects with mottled brown wings and have a characteristic angular posture. Eggs are almond-shaped, bright yellow to orange and are deposited on developing shoots or feather flush. Adults lay up to several hundred eggs that hatch in about 4 to 10 days. Nymphs are 0.25 to 1.7 mm long and are yellowish orange. There are five nymphal instars which take about 13 to 39 days to mature into adults. Nymphs produce waxy tubules from their posterior end that help divert the honeydew away from their body. Eggs develop into adults in 14 to 49 days depending on temperature. Average longevity of adult female varies between 29 and 88 days at different temperatures. Optimum temperature for development is 25-28oC (77-82oF) and life cycle can be completed in 29 days at 28oC (82oF). Management: Due to its extensive distribution in Florida it is not expected to be eradicated in that state, but eradication is possible in its new home, California. Chemical control is possible with neonicotinoids like imidacloprid and dinotefuran, pyrethroids like bifenthrin, deltamethrin and fenpropathrin, the organophosphate, chlorpyrifos, the carbamate, carbaryl, and the ketoenol, spirotetramat. Biological control is possible with several generalist predators like spiders, lacewings, syrphids, minute pirate bugs, coccinellids (lady beetles) and several parasitoids. Harmonia axyridis andOlla v-nigrum are abundant and effective coccinellid predators and imported hymenopteran, Tamarixia radiate is a well established parasitoid in Florida. Microbial control is possible with entomopathogenic fungi likeBeuveria bassiana, Metarhizium anisopliae, Hirsutella thompsonii and Isariaspp. which were found pathogenic to ACP. Several formulations of these fungi are commercially available. What to do:Southern Santa Barbara Co is currently under quarantine. 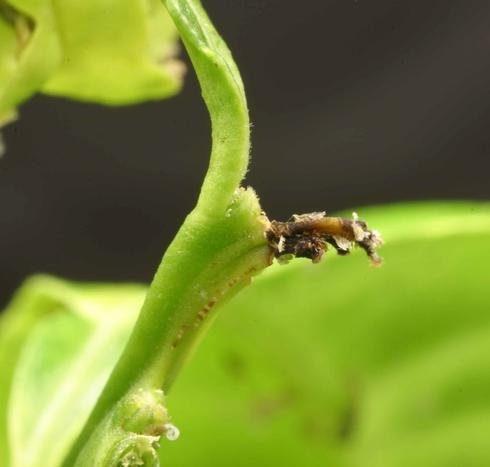 If you have citrus or related host plants, periodically examine the newly developing leaves for ACP feeding damage, waxy substance, honey dew and sooty mold. You can also look for leaf mottling, a symptom of citrus greening. If you find ACP in a new area, please secure the specimen, note the location, and send or bring in the specimen. You can reach me at 805-788-2321 or skdara@ucdavis.edu. Grafton-Cardwell, E. E., K. E. Godfrey, M. E. Rogers. C.C. Childers and P. A. Stansly. 2006. Asian citrus psyllid. UC ANR publication, 8205. Halbert, S. E. and C. A. Nunez. 2004. Distribution of the Asian citrus psyllid, Diaphorina citri Kuwayama (Rhynchota: Psyllidae) in the Caribbean basin. Florida Entomol. 87: 401-402. Liu, Y. H. and J. H. Tsai. 2000. Effects of temperature on biology and life table parameters of the Asian citrus psyllid, Diaphorina citri Kuwayama (Homoptera: Psyllidae). Annals of Appl. Biol. 137: 201-216. Michaud, J. P. 2004. 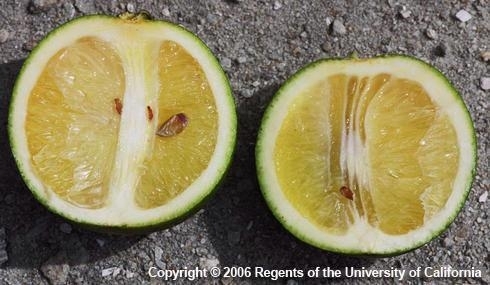 Natural mortality of Asian citrus psyllid (Homoptera: Psyllidae) in central Florida. Biological Control 29: 260-269. Padulla, L.F.L. and S. B. Alves. 2009. Suscetibilidade de ninfas de Diaphorina citri a fungos entomoatogênicos. Arquivos do Instituto Biológico (São Paulo) 76: 297-302.